Following the intense 2017 Atlantic Hurricane season, countless homes, businesses and communities across the U.S. and Virgin Islands are still working to recover and rebuild. Partnering with NBC's TODAY show, BELFOR Property Restoration CEO, Sheldon Yellen, proudly joined Al Roker for the show's "Lend A Hand" se​ries to help deliver life-changing donations and supplies. Along with other generous donor​s, Al and Sheldon visited some of the hardest hit communities by hurricanes this storm season including a church in Spring, Texas and a school in San Juan, Puerto Rico. On Tuesday the crew made their first stop at Trinity Klein Lutheran Church in Texas, which served as a safe haven for members and the local community in the aftermath of Hurricane Harvey. Operating as a temporary shelter, the church also became a distribution hub for flood relief supplies and a meeting place for first responders. 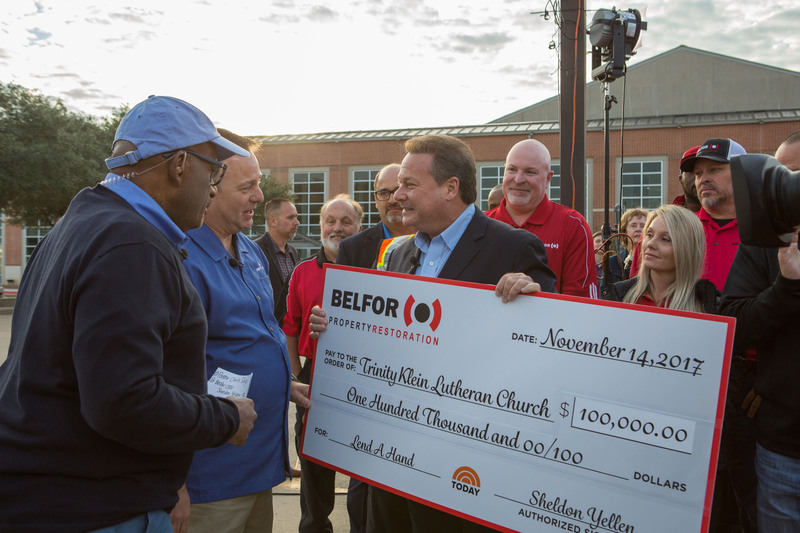 Honoring the compassion and camaraderie of the humble Pastor and congregation, BELFOR generously donated $100,000 to help rebuild the church community. Preparing for the next stop at the Martin Garcia Giusti School in San Juan, Puerto Rico, Sheldon and BELFOR's emergency response team packed an airplane full of school supplies and goods. With the community still struggling to fully recover from the devastation of Hurricane Maria, many students have been unable to regularly attend classes with adequate materials. On Wednesday, Sheldon and the BELFOR Team proudly delivered a truck with over 35,000 lbs of filled backpacks and other humanitarian goods and supplies to the deserving students and presented the Puerto Rico Department of Education width a check donation for $100,000. BELFOR has developed a culture of being there for people and communities when it counts most. With hundreds of thousands of clients relying on the company each year to help rebuild their lives, homes and businesses, it's a honor to give back and support others through difficult times. The entire BELFOR Team is incredibly thankful to the TODAY show for the opportunity to "Restore More Than Property" and touch the lives of these resilient communities.